Precious Metal Clay is truly precious because it gives the jewelry designer the freedom to create totally unique piece of jewelry. It looks and feels like modeling clay, but it contains tiny particles of pure fine silver or pure 24K gold. It can be rolled, pinched, molded, impressed, extruded and sculpted into any shape. The basic clay material is called lump form. It comes in a sealed foil packet and is ready to use. Lump form can be used to roll slabs or snakes, and can be molded or sculpted. It can be thinned with water or used as a paste. A rubber stamp or any textured object can be used to impress beautiful designs into the PMC before it is fired. Slip form (or paste) comes in a jar or loaded in a syringe. The paste form is used to glue wet or dry PMC objects in place or for slip casting, for painting onto an object for a hollow form, and decoration. The syringe is used to extrude wire for decorating, setting stones, or filling cracks. Paper form is a very thin sheet of clay that can be used to make bezels for objects to be set, used for ring shanks, or folded like origami. Shapes can be cut out with punches and applied as decoration. It can also be laminated with water to make it thicker. Man-made gemstones, like Cubic Zirconia, and many natural gemstones can be set into the clay either wet or dry, and safely fired in place. Porcelain, glass, dichroic glass, and parts such as clasps, can be fired along with the clay. You can even bond metal clay directly to sterling silver. Artisans and craftspeople will enjoy making pendants, rings, earrings, or pins that can be free-form and trendy or your own version of a vintage piece. Using the Low Fire clay, you can experiment by adding beads, gemstones, or glass cabochons to create a truly unique design. After the PMC object is fired in a kiln or with a torch, the clay part burns away, leaving you with a piece of pure gold or fine silver. The metal object can then be filed, sanded, carved, drilled, engraved, riveted, enameled, or polished to embellish the surface. If you would like to learn more, there is an Excellent Resource for Precious Metal Clay at Squidoo. abalone shell has been highly prized by jewelry makers for centuries, because it reflects the beauty of the ocean on a sunny day. Some call the Abalone's iridescent shell Mother of Pearl, but that term refers to the lining of an oyster shell. Abalone shell offers a shimmering palette of colors, from blues and greens to sunset pinks and purples, all in one amazing piece. This bracelet is the Metropolitan Museum's adaptation of the iridescent peacock blue Tessarae (tiles) that once encircled a column in Tiffany's showrooms on Madison Avenue. You can buy it at their website. Just click on the image. 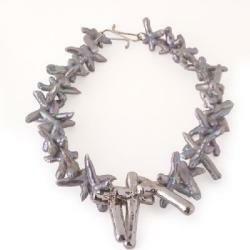 Abalone jewelry is a great alternative to gemstone jewelry. It glitters, it's nature-made, it's beautiful, and it's very affordable. Because of its play of colors, you can wear Abalone jewelry with virtually anything. It accessorizes well with a myriad of colors. It can be casual or elegant, and it looks great with silver and gold. These highly-prized mollusks are also a delicacy in many cultures, found naturally in California, Japan and other Pacific regions. Abalones like to clamp tightly to rocky surfaces and dine on the algae floating by. Abalone cultivation began in the late 1950's and early 1960's in Japan and China. It grew rapidly in the 1990s, and is now widespread in many countries, including the USA, Mexico, South Africa, and Australia. The largest cultured abalone producer in the world is China with over 300 farms and a total production of approximately 3500 tons. Worldwide, there are over 15 species of abalone which are farmed and commercially important. Species can live in water temperatures ranging from 2C to30C. My call for entries is still open until early December. I've had some great submissions, but I'm still looking for more. Here are the details below concerning the project I'm working on as well as the guidelines for submissions. Series: This text will be part of the publisher's "Picture Yourself" series. Book's Focus: The focus of this book is super simple to make metal clay component projects (charms, pendants, beads) teamed up with basic jewelry techniques resulting in projects which allow readers to make finished jewelry pieces showcasing their metal clay creations. Audience: The audience is the interested hobbyist who has very little if any metal clay or jewelry making experience. Project Descriptions: All metal clay projects will be designed to use low-fire metal clay (either PMC3 or Art Clay 650) and will be small enough to allow firing by either a hand-held butane torch or hot pot. The projects will include instructions for both making the metal clay component (such as beads or a pendant) as well as incorporating this item into a finished piece of jewelry (such as earrings or a necklace). Therefore, other jewelry techniques including basic bead stringing and wire work will be covered as well. Gallery Format Submission/Instructions: All items submitted for the gallery must be sent in digital .jpg format, min. 300 dpi, emailed to tammypowley@yahoo.com by Dec. 5, 2007. Please include "metal clay gallery" in the email subject line. Along with the image of the finished jewelry piece, include type of clay used, form of firing used, and any other materials information. Though low-fire clay items are encouraged, since that is the focus of this book, other types of clay items will be considered for gallery inclusion. Those artists selected for the gallery (included in the final published copy of the book) will be required to sign a release for publication form and will have their names and contact information (if desired) included in the gallery section. Project Format Submission/Instructions: Though the author will create the majority of projects for the book, some projects by guest artists may be included if they are deemed appropriate for the scope of the book. Entries should include projects using low-fire metal clay (either PMC3 or Art Clay 650) and should be fired using either a butane torch or hot pot. A list of supplies and basic techniques should be included along with step by step digital color images of the process. (The author will write up complete instructions for any accepted projects.) Images should be clear, high quality, .jpg format, min. of 300 dpi, and emailed to tammypowley@yahoo.com by December 5, 2007. Please include "metal clay book project" in the email subject line. Those artists selected for the projects section (included in the final published copy of the book) will be required to sign a release for publication form and will have their names and contact information (if desired) included in the text. The author will also send them a free copy of the book when it is released for publication. Disclaimer: The author will accept submissions in good faith and as she deems appropriate for the book; however, this does not in any way guarantee publication since other issues such as space, page numbering, page breaking, etc. can require the publisher to make alterations to the finished text without the author's knowledge. A new web site and accompanying blog, contributed by you-know-who, has hit the Internet air waves. It's called Metal Chik, and while its primarily focused on those who make jewelry, really any jewelry lover will find loads of great information over there. In fact, those who buy jewelry rather than make it should still be knowledgeable about jewelry, and this site is a good place for that because it will feature weekly jewelry making videos. Inside every woman-whether she's soft and feminine or tough as nails-beats the heart of a metal chik. We all dig jewelry, don't we girls? But making beautiful jewelry? That's beyond most of us, right? Not anymore. Now there's Metal Chik: Jewelry Design and Metal Work De-Mystified. Victoria Tillotson is the ultimate metalchik, the mistress of metals and rocks. She knows their secrets-how to bend them, shape them, and join them into exquisite decorations that bring out a woman's inner soul. (Or a man's for that matter.) Now she's bringing her funky, unique style of teaching-by-doing to the Internet to share those secrets with you. On Metal Chik, Victoria and her apprentice Adam teach you how to do your own bling. They provide clear, concise primers-how-to's on the hottest trends in jewelry. Like how to make a hammered silver earring in two short minutes; how to construct a personalized chain mail ensemble using easy-to-buy copper or silver sheets; or how to revamp your old jewelry into new stuff that's fresh, exciting and you. They'll also teach you how to dig up the best deals in diamonds, hunt for buried treasure on e-bay, and use the Internet to uncover vintage pieces at a fraction of their cost…information that can help you start a great collection, or create a unique personal style. SiopaEile.com founder Paul O'Mahony said "This is a great opportunity for Irish Artists to exhibit themselves and their work online and reach a new world wide audience. Blogging has been a revolutionary way of connecting with people all over the world. It's a cost-effective way of marketing your art and it brings life and personality to your online presence thanks to the natural human interactivity, which websites on their own generally fail to achieve." Once auditions end, a group of 10 artists will be selected to be part of this group blog, with every artist contributing to the blog on a regular basis and sharing the stage as their audience grows. You can find out more about his idea as well as how to apply, where else but, his blog. 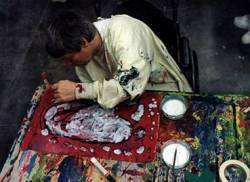 Passion Works is an organization that works to support artists with and without disabilities. According to the groups web site, this is their mission and vision: "Passion Works will be a premier art studio that supports collaborations between artists with and without developmental disabilities. [...] To create and live out a best practice model for collaborative art making between artists with and without developmental disabilities. This new mindset demonstrates that creativity is innately a part of all people and recognized that art enhances the quality of life and strengthens communities." Not only are they inspiring, but they have some adorable jewelry to boot! 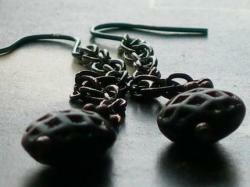 Like this Passion Works Guy, which comes as a tie tack (what a great guy gift), pendant, or earrings. They are pewter, but the findings, like the ear hooks are silver. Royal Silversmiths' craftsmanship, design and reputation have won the adoration of not only Warner Brothers (crafted the Golden Snitches for the Harry Potter films), but the Royal Family as well (made the Coronet for the investiture of HRH Prince Charles). Royal Silversmiths holds a Royal Warrant from HM queen elizabeth II and ISO9000 (the international quality system), which dictates all products be made by highly skilled silversmiths, using only the finest materials. In celebration of the company's 60th Anniversary, they have hired 8 designers to create a whole new anniversary collection, spanning from jewelry to flatware, and lots of gorgeous sterling silver pieces that fall somewhere in between. They were nice enough to send me a few images of jewelry from this new collection just for my readers, but of course, you can find lots more on their site. A ring that is top-heavy or bulky will always slip to the left or right if improperly designed. All pendants require first finding the center of gravity to assure it hangs correctly on a chain or omega necklace. Naturally, rings, bracelets and even pendants with clusters of stones requiring multitudes of prongs will snag clothing and such endlessly. Prongs also require constant inspection and maintenance, the loss of one prong on four prong settings will result in stone loss. Designs that incorporate channels or bezels to hold diamonds are absolutely snag-proof; there are many ways to hold gemstones in jewelry without the use of prongs. I'm not saying that I'm against using prongs, in many design applications they are required to achieve a certain look. As long as the prongs are strong and not high up in the air they are less likely to snag. One of the worst design mistakes is actually attaching a pendant directly to a chain or omega. Shaping it to a "V" at the center of the chain makes it even more dreadful, the chain should be split with some kind of movable link on either side of the pendant to avoid flipping and twisting.